This kind of chess called color chess. Now we present to you blue chess and soft violet chess, one of color chess product. 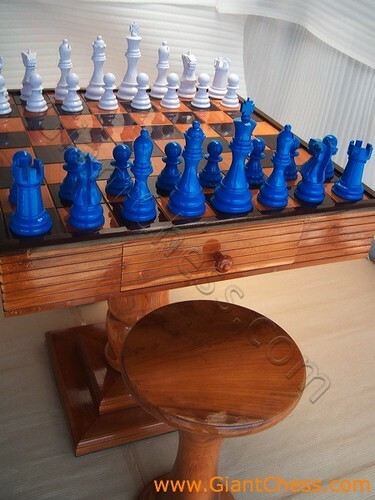 They stand on wooden chess table and complete with two chairs that made of Teak wood. The chess set, chess table and wooden chairs looks so interesting. Those products are made of the strongest and the best wood in the world, Teak wood. So you can use it outdoor and indoor because it's very durable for any seasons and weathers. Show your true colors! Choose your favorite team / school colors or having chess game using this color chess. Sure that you will enjoy your game, especially if you play it at your garden or backyard. We have another colors of wood chess set so you will have many choice. Make your game colorful and interesting with your partner. You may use this color chess set as house decoration or a gift for your friend and family.